This post is sponsored by Jord, all opinion are my own. Remember how I've been posting gift guides for the past couple of weeks? Well I want to tell you about a particular item that ANYONE in the family would love to have and I'm about to tell you why! Since I was little I have always seen a watch on my sisters, mother, father, and now in laws. It's something many people use but now with cellphones and other gadgets, it almost seems like they are becoming less common. Whether you think they aren't stylish or no longer hip, let me prove you wrong. With it being the end of the year we cannot help but review our year, we think of the sad moments, the happy moments and everything in between. We sometimes can't help but think that time is just passing us by, that it's a theft as alice would say, or that we can't wait for a certain moment in time to occur, and that's ok..sometimes, its something natural us humans think about, but what if we saw time as a gift? Now that Christmas is a week and a half way, we need to cherish and think about the present time. See what's important is focusing on the right now, what we have right now. As a parent I'm trying to be grateful for my son being this age right now, that we have food in our bellies, and a roof over our head. I have a family, I love them and they love me. We are healthy. That's what matters. See a watch isn't just for telling us what time it is, but also telling us that we need to enjoy right now, the present. I love the above quote because it speaks the truth! So now that I've told you why you should get a watch this holiday season, let me tell you from who! Jord is a company that specializes in providing stylish, modern, wood watches! They have several different types of wood watches that fit the everyday person. You can immediately tell they are 100% wood by the smell, I love it! Did I mention they have the feature to engrave their watches, so if you want to give a sentimental gift this Christmas then you can give both a useful accessories and a special touching quote on the back! I may have given Rex his early Christmas present, I mean he did also help pick his style and color before he ever thought it was a gift. But he was absolutely thrilled when he saw his gift! He wears it everyday and it goes with everything he wears. Believe me when I say that Rex usually never wears a watch, so to have him wear it pretty much everyday, it a huge accomplishment in my book! Go wifey! 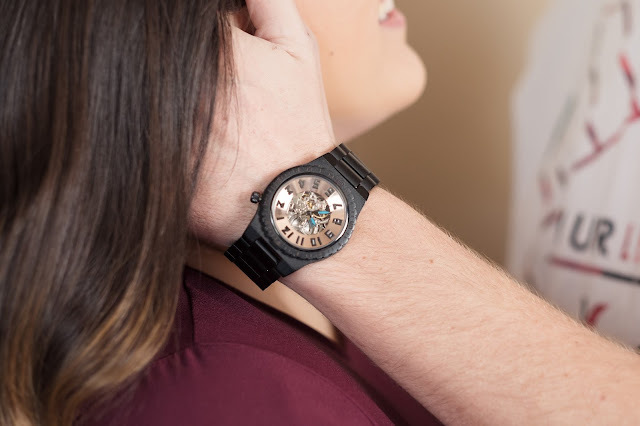 So the Jord Watches are not just for your spouse, but can given to anyone in the family. Watches are not just for telling time but for also having you focus on what really matters, the moments you are creating now. So if you ever wondering what gift anyone and what it to have a story or message , Jord is your pick this holiday season! That watch is beautiful and makes the prefect gift! I love the watch! I'm so picky about men's watches and I love that this has real, quality wood and can be engraved. So simple and stylish! Thanks for sharing, Valentina!